Another day laid up in bed in my Sweaty Betty hoodie! But you're not getting a peek. Instead, I'm sharing a good friend and local businesswoman's look. Meet Lisa..
Lisa's a mum of 3, owner of Weecycle in Finaghy, Belfast and a huge River Island fan. When I popped in last week to take this photo, she was wearing a River Island Gilet (similar) & Jeans, Grey Ugg Boots and a gorgeous elephant scarf from Next. 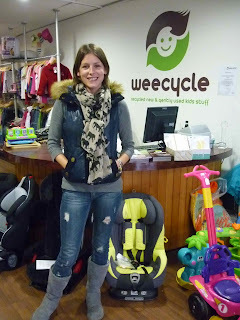 If you're in Belfast and have not been to Weecycle, make a resolution to drop in some day soon. It's a fantastic shop that sells gently used designer kids and maternity wear and all of the nursery items (also gently used) you could ever need for your little ones. I'm past needing nursery stuff now but her kids clothes go up to age 8 so I still get most of my girls' clothes there. As well as that, Lisa will sell your unwanted items on a consignment basis. Give the shop a call on 028 9030 1107 if you have items to sell and they'll fill you in on how it all works. If I didn't meet Lisa every week, I would definitely head to Next to pick up her elephant scarf. It makes a nice change from the zebras which are popping up everywhere! So as I can't buy it, I'm now on the lookout for a giraffe scarf. Watch this space..